Many good things happened in 2016. Positives notwithstanding, however, the year had a few pretty craptastic events that tainted many of the days. Several unpleasant-if-mundane realities occurred — things that happen to everyone but had an extra layer of, well, crap. After much deliberation, I have determined the cause to be herring. 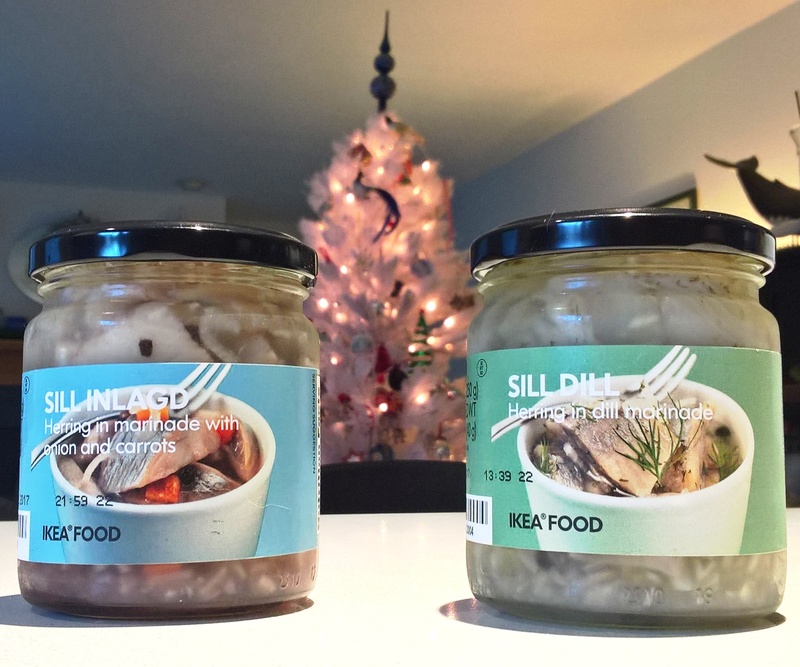 Specifically, the New Year’s pickled herring. 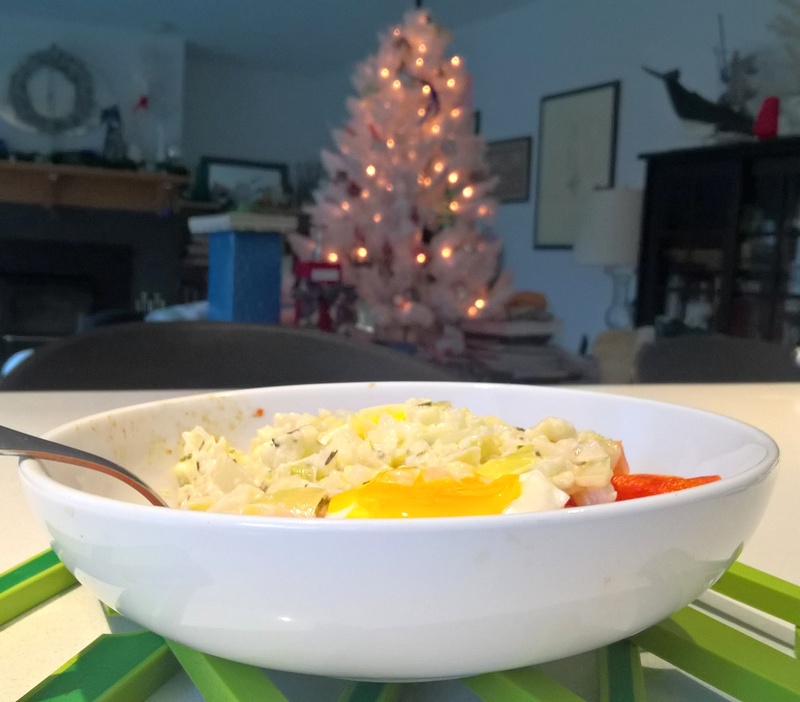 Eating pickled herring on December 31 and the next day (superstitions only work if you cover all possibilities. . .) is the only New Year’s tradition I have observed without fail since childhood. There’s a little quirky history behind it that I love — acknowledging the uncertainty of the future while hoping for good fortune. Rewind to the last day of 2015 when I found myself without a jar of pickled herring. Dashed to the closest grocery store. While I couldn’t tell you the name of the brand that’s ubiquitously available, I can tell you it wasn’t stocked at this store. Something told me what was available was inferior, but I bought it anyway. Inferior it was. Mushy, not much flavor, and way too sweet. Determined not to let this unpleasant fate befall another year, I planned and purchased with intent and purpose: A month ahead I took advantage of being near IKEA, cooler in the car. In the words of Emerson, Lake, and Palmer, “Hallelujah, noel, be it heaven or hell, the Christmas we get we deserve.” Clearly the sentiment extends to the following week’s holiday. And I, for one, am starting 2017 with forethought and positive action. 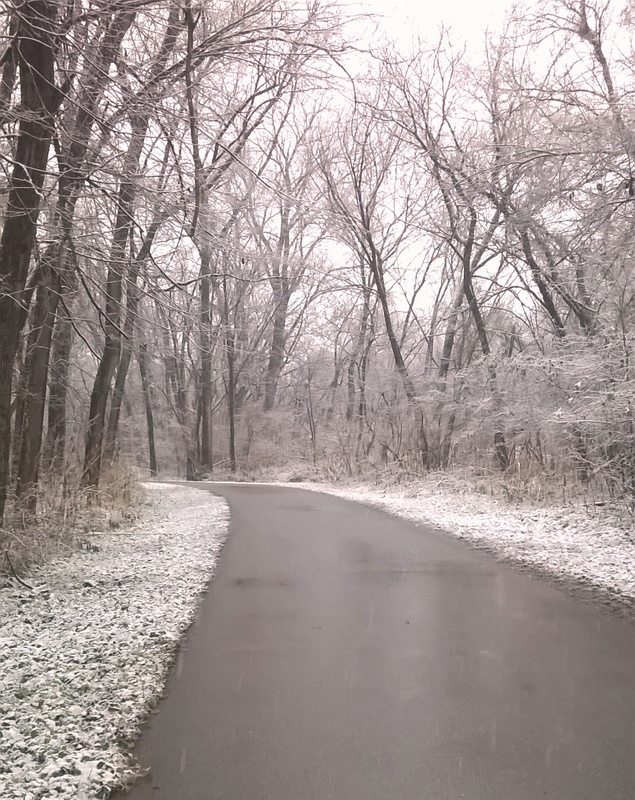 May the new year bring you unexpected opportunities for joy and ample rewards for your efforts. My first go at making Parmesan Mousse went well, but the surprise came in the spoils. Onions and rosemary are cooked and steeped in heavy cream. Their flavoring work complete, they’re strained out and discarded. Looking at the strainer, I couldn’t help but take a flavor-filled bite. Some of the parm clings to the onion bits. Hmmm. Grab a small leftover potato. Slice up a tomato. Combine and heat in the microwave, then broil for a few minutes in the toaster oven. In between those cooking steps, soft-cook an egg (I did a 6-minute steam). 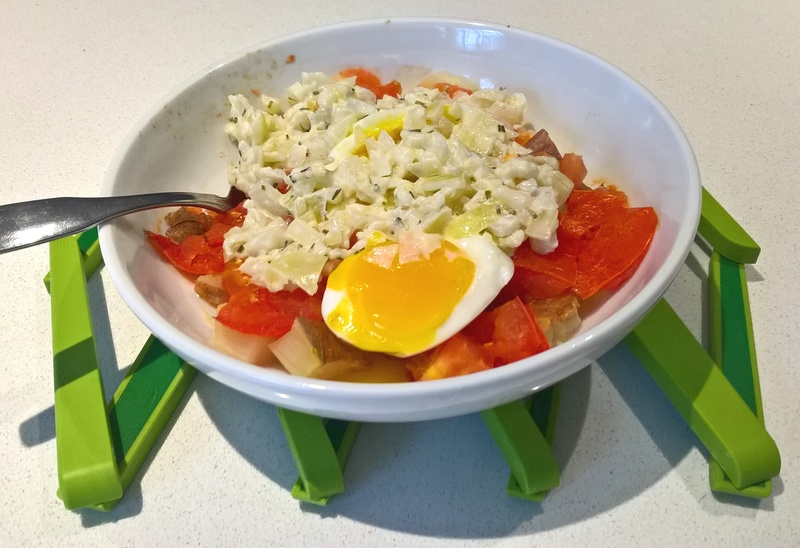 Top potato-tomato mix with cooked onion spoils and the egg. Sometimes I surprise myself — in this case, delightfully so! Here’s another quirk: The onions are mild since they’ve been well cooked; a good choice for me because I don’t like strong onions in breakfast dishes. But then I generously topped the dish with Frank’s Hot Sauce. . .
Merry Christmas to all; may the day bring you happy surprises. Have you noticed? Lately I’m compelled to add exclamation points to my headlines. Maybe I’m just that excited about the holidays. In this case, the reason was to make it ‘sound’ like a short-order cook calling out from the kitchen. 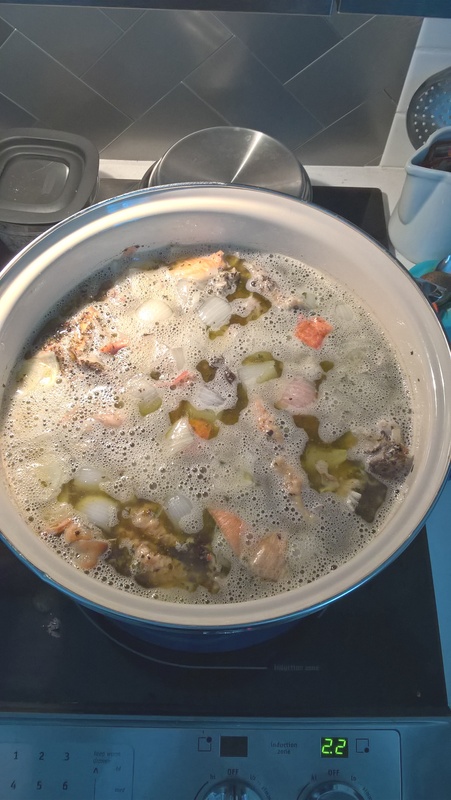 Big batch of stock from turkey and chicken bones – Chickey? Turken? Whatever the name, it is yummy and we’ve got a lot of it. I’m thinking butternut squash risotto, because wait until you see the size of the butternut squash I bought at — surprise, not! — Costco! OK, I’m only posting this because I’m mad about the title I came up with! It’s the serendipity of two unrelated things happening on the same day. Silly me, a little fun for you. 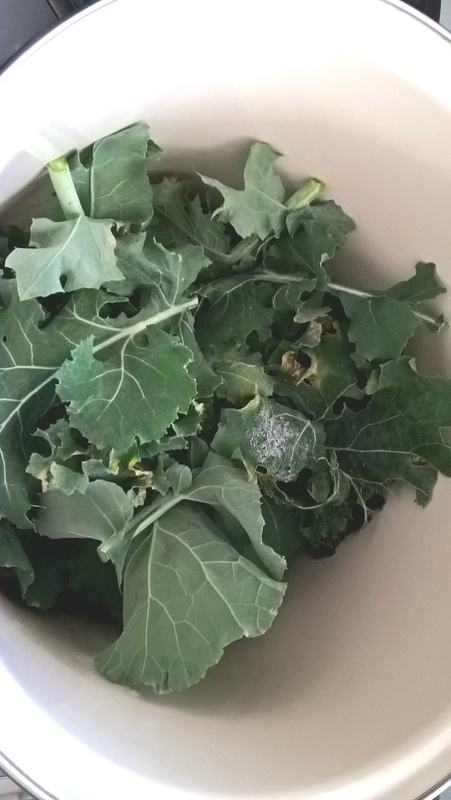 The last of the season’s kale. Note the frost. Into a batch of green soup. And, it appears, the end of the yogurt maker. Farewell, faithful companion. While the machine itself is more than two decades old, I’ve only used it regularly for 5 or 6 years. And by regularly I mean once a week. Really. We eat homemade yogurt most days. 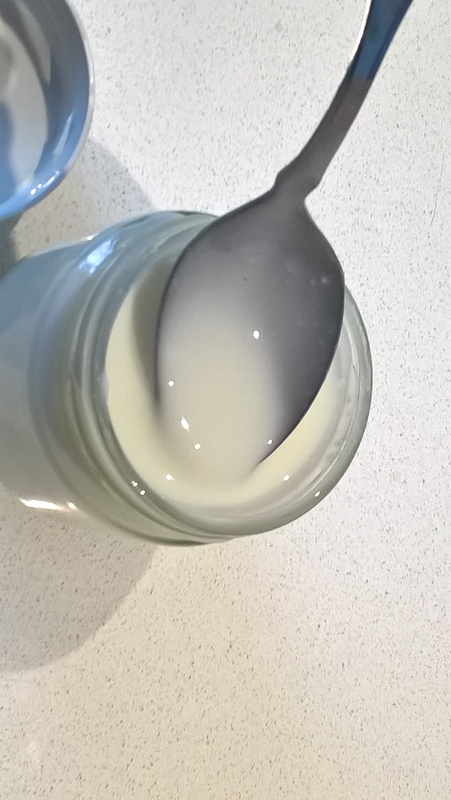 But from the consistency of this yogurt, well, looks like the heating element has finally gone kaput. The hubs used his infrared temp thingie and it registered only 78 degrees. That won’t do. Another matching bird flies low overhead and lands near the others. 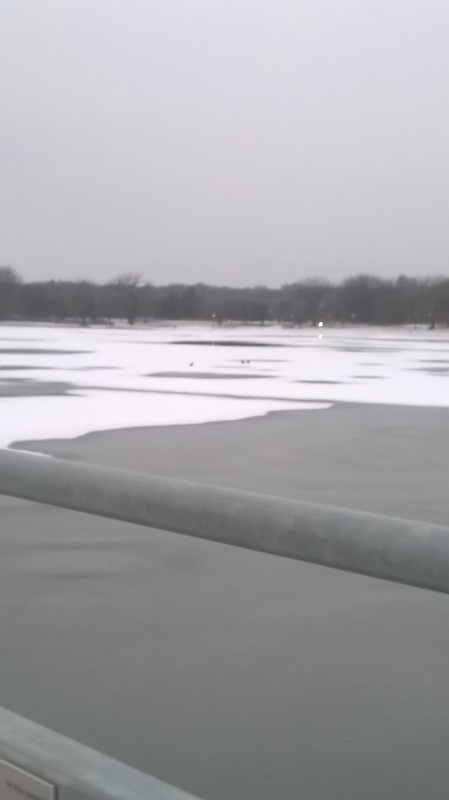 One bird flies away, another takes to the air swooping over the open water closer to the bridge. After almost a minute of watching the bird, reach for phone. 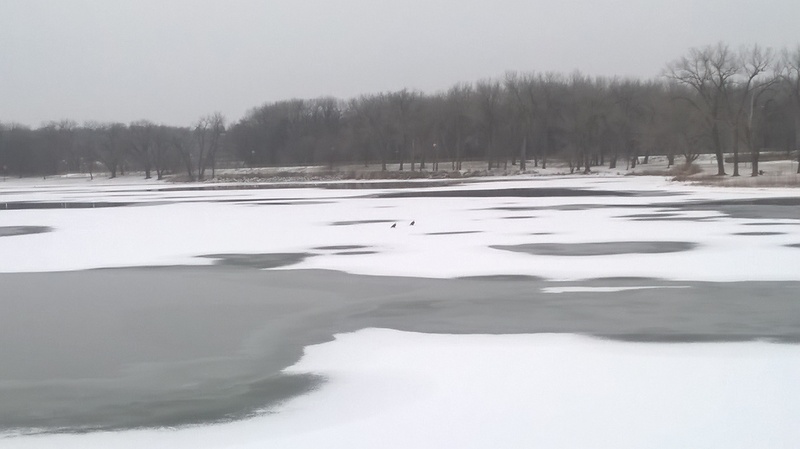 Bird immediately flies back to the resting spot on the ice. Some things are meant to be enjoyed in the moment.